New York City beckons travelers, tour directors, and tour guides, offering so much, it is difficult to decide what to see. 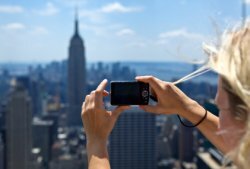 There are many tour operators in NYC, and many from out-of-state that organize tours in NYC. So much of our country's history and culture are evident in this city. Many Europeans will fly in for a week-end in New York City, and fly back to Europe without visiting anywhere else. The tour director's role here, as everywhere, is to manage the logistics of the tour, invisibly to the guests, while providing opportunities and experiences to maximize enjoyment of the visit. Logistics are particularly challenging in New York City, with its excess of people and traffic. It is difficult to maintain a tight schedule when it can take an hour to drive from one end of Manhattan to the other; the island is 14 miles long. A tour director bringing in a group from out of state can take them around the city in a bus, and can tell them what they are seeing from the bus, as is true of any tour. Yet as soon as guests leave the bus, the commentary must be conducted by a licensed New York City guide, who may or may not be the tour director. Licensing is done by the city government. The prospective guide must take a written test, which includes photos of noteworthy sites in NYC. There are classes offered to help prepare for the test, with field trips around Manhattan to learn routes and identify sites. New York City is a popular destination for high school groups, particularly drama clubs, who come to enjoy Broadway plays. Student tour companies such as Smithsonian Student Travel and Worldstrides specialize in creating an educational and enjoyable experience for the young guests and their adult supervisors. Student itineraries are packed with activities, with the goal of keeping students active and involved, and out of mischief. For many students, this trip may be the first time they have been on an airplane, their first time away from home. While it is the responsibility of the adults to manage the behavior of the students, it is also the responsibility of the tour director to keep students engaged and interested in what the group is doing.